Valentine's day just passed and I'm guessing some of you might be wondering what I did during that day. I can't promise to blog about any sweet and/or romantic stuff but what I can promise is a new way of celebrating cupid's visit! FEB 14, 2013. Yes, Wingstop CDO offered something new on Valentine's day. 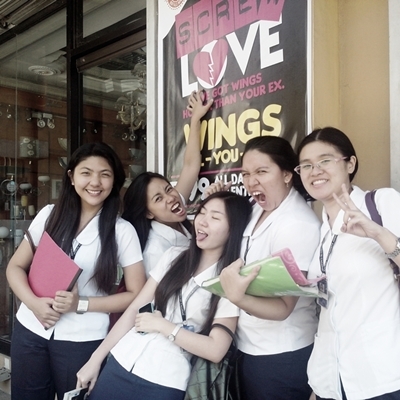 Instead of being all lovey-dovey and stuff, my friends and I supported bitter and single people by joining an anti-valentines campaign. 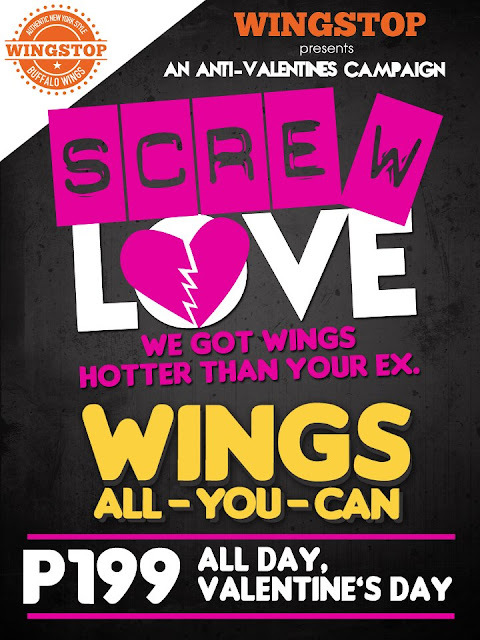 No, it's not an actual movement but the thought of being able to gather single people and the like for a day of eating delicious chicken wings non-stop, is randomly awesome in a way. Somehow, it gives us this thought that celebrating and being happy on Valentine's day doesn't actually depend whether you've found your boyfriend/girlfriend, all you need to be merry on hearts day is your family and friends, who unlike your so-called bf/gf (or ka-fling, if some considers this fact) for the moment, has this unconditional love for you. 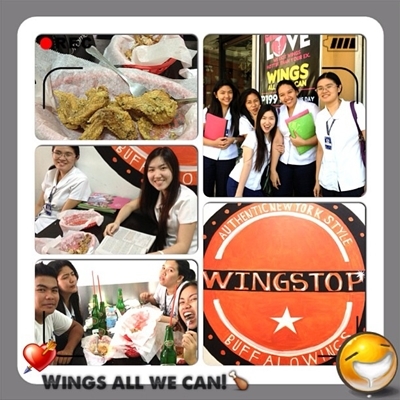 I celebrated my Valentine's day eating my heart out on some chicken wings together with my friends while talking about random things and random people. That alone shows enough love. We didn't thought it'll be this many. Sir Josh, the owner, really surprised us. 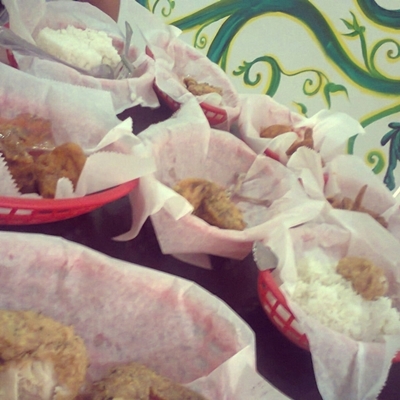 Garlic Parmesan Chicken wings + Original Flavor = YUM~ Burp! Someday, my friends and I will be growing chicken wings from eating Wingstop's chicken way too much. 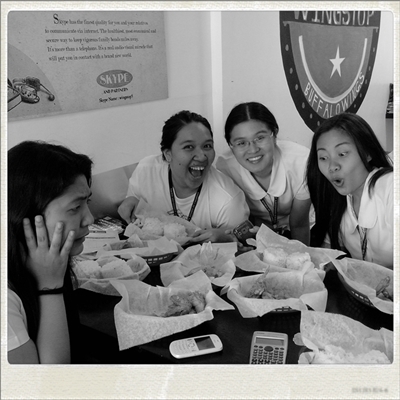 Photo grabbed from Shebby's instagram. FEB 16, 2013. 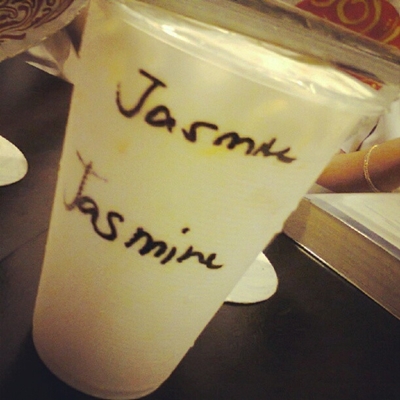 My bestie and I went to chill in Chingkeetea when suddenly Chingkee Te, the owner, offered us to do some artsy stuff. 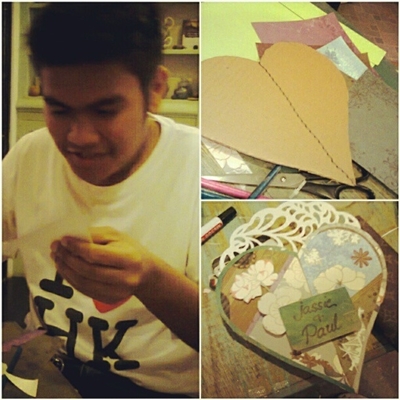 She gave us a heart-shaped cardboard, stationaries/fancy papers, marker and a glue and told us to "beautify" the heart cut-out. 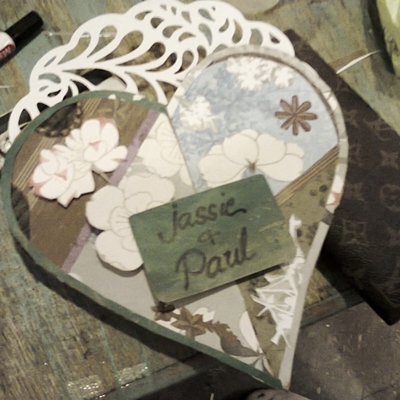 Instead of doing this together, I proposed a match between me and Paul on having the best design. We divided the cardboard and materials and started doing the craft. This guy has never been the "artsy guy", nor was he ever interested in doing anything related to arts. It's good to see a new side of him sometimes, and I thank Chingkee Te for this. Well, since we shared the materials and were sitting beside each other, he copied most of my idea and ended up, well, to what you're seeing right now. But because of my 3d effect (kind of) on the flower and name plate, Anamae (who magically came out of nowhere and proclaimed herself as a judge) called me the winner! YAY! FEB 17, 2013. Janine, Jara and I watched the movie MAMA after Janine and I did some school work. It's funny how Jara invited us to watch the movie with her when she was the only one who tried closing her eyes just to avoid seeing the scary scenes. 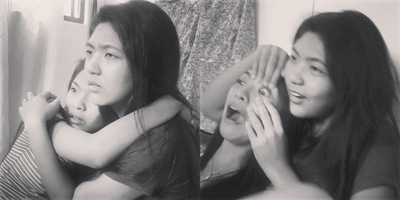 On the right photo, you can see me opening Jara's eye forcibly to make her see the scary parts. I'm harvesting the fruits of making her see all the thrilling parts right now, and unfortunately, it isn't nice. She's tucked in my room right now. 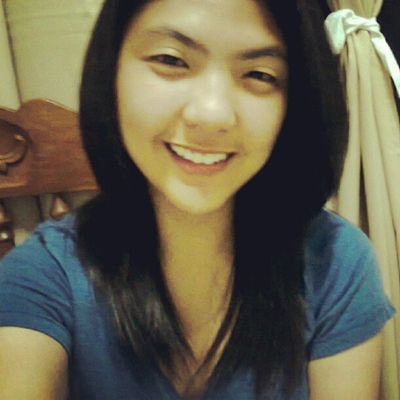 After watching MAMA, I had my long hair cut off! It's weird because instead of me being all sad and worried about my long hair, I was happy and even said "Goodbye and good riddance you stupid hair". I don't know, I might have grown to hate my long hair because of the hot weather we're having. 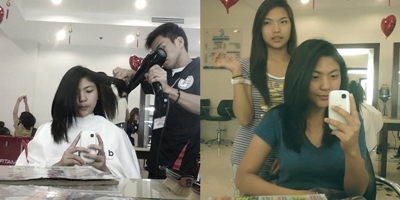 Anyway, my sister was the sad one during my haircut. Was she attached to my hair or something? I don't know.